This post will focus on the scapula and the clavicle elements of the shoulder girdle. The scapula provides the back of the shoulder, and the clavicle articulates with the sternum (discussed in previous post) and the top of the arm (the humerus). The humerus will be discussed in a subsequent post on the elements of the arm. Together with previous posts on the spine and rib cage, this post makes up the ‘trunk’ of the human body. As ever, care should be taken during excavation & examination. Both the scapula and the clavicle are fairly tough elements and survive well. The body and medial border of the scapula is liable to damage however as it is a thin blade of bone (Mays 1999). On mainland Europe the study of anthropologie de terrain (the study and alignment of the body in a burial context) is often used, especially so in prehistoric sites. Interestingly by examining the placement of the clavicle bones in burial, you can often tell whether a body has been covered in a shroud or likewise garment in the deposit of the cadaver. The clavicles are often found near vertical in the upper chest cavity, which itself is often tightly bound. 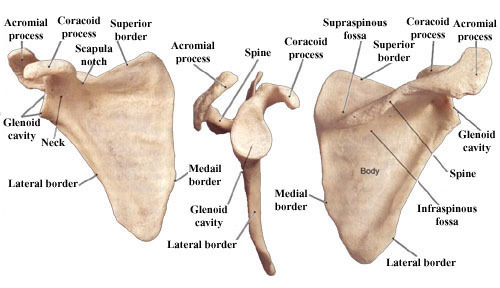 Anterior view of the shoulder elements, note only the clavicle and scapula are discussed in this post (Image credit: Britannic Inc 2007). The clavicle is easy to palpate in your own body, along the length of the bone whilst the scapula spine and acromial process (see below) can be palpated just adjacent medially from the top of either arm. 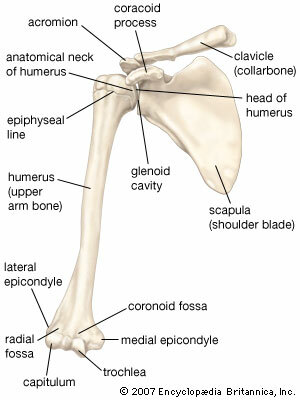 As for any shoulder element, there are two clavicles present in the human skeleton. As demonstrated by the above and below diagram, the clavicle is a tubular S shaped bone that sits anteriorly in the shoulder joint and is easily palpated. The clavicle is oval to circular in cross section (White & Folkens 2005: 193). The main anatomical landmarks are featured in the diagram below. Landmark features and muscle attachment sites for clavicle (click to enlargen). Image credit: Wikipedia. The costal impression is a broad rough surface that anchors the costoclavicular ligament, which strengthens the joint. The lateral side of the clavicle has two major attachment muscle sites for the trapezuis & deltoideus muscles (White & Folkens 2005: 193). The clavicle articulates with the acromial process of the scapula at the lateral end, whilst at the medial end it articulates with the clavicular notch of the manubrium. The clavicle is often broken during a trip or a fall as the bone is so close to the skin, and acts as a supporting strut (Marsland & Kapoor 2008). There are a few main points to consider when siding a clavicle. The medial end is rounded whilst the lateral side is flattened. Most irregularities are roughenings are on the inferior edge of the bone, whilst the bone itself ‘bows anteriorly from the medial end, curves posteriorly at the midshaft and sweeps anteriorly again at the lateral flat end’ (White & Folkens 2005: 195). The scapula is a ‘large, flat, triangular bone with two basic surfaces; the posterior (dorsal) and costal (anterior, or ventral)’ (White & Folkens 2005: 195). The bone articulates with the humerus at the glenoid cavity (or fossa), and the distal clavicle on a small facet on the acromion process (see below diagram). The ‘coracoid process just anteriorly and superlaterally from the superior border of the scapula’ whilst the acromion process is the lateral projection of the scapula spine. 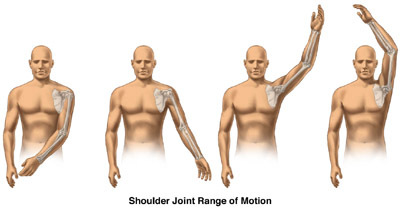 Both of these projection points provide anchoring points for a number of key muscle abductors, rotators and flexors, amongst others (White & Folkens 2005: 200). The glenoid cavity provides the humeral head with great mobility because of how shallow the fossa is; however the arm can be easier to dislocate then the leg bones (Marshland & Kapoor 2008). The scapular spine provides an anchor point for the acromion process, and it key in distinguishing the posterior aspect of the body. Distinctive landmark features on the scapula (anterior view, lateral view and posterior view). Image credit: Wikipedia. Interestingly scapula fractures are rare in the archaeology record, but when evident they are usually located in the blade of the bone. They are usually marks indicative of interpersonal violence due to the posterior position and location (Roberts & Manchester 2010: 104). However as pointed out above the blade is usually damaged before or during excavation due to its delicate nature. Another feature to be aware of is the lack of fusion that can take place at the acromion epiphysis (growing plate). The most famous case concerning the lack of fused acromional points in a skeletal series are from the remains of individuals from the Tudor ship The Mary Rose. 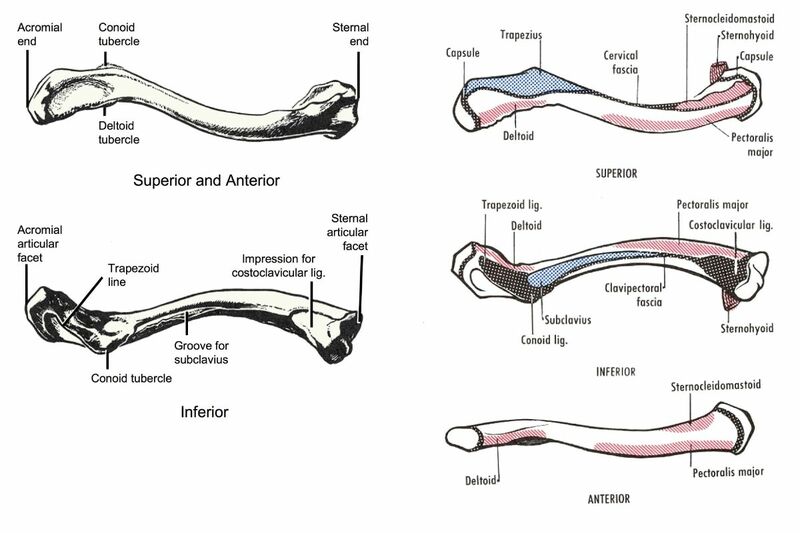 Of the skeletons studied, 13.6% of their number had unfused acromions (see diagram above/below). The reason suggested was that they represented the archers aboard the ship, and had practised since childhood which had prevented any fusion of the element because of the constant stress, strain and movement needed to be a top bowman (Roberts & Manchester 2010: 105). Posterior shoulder anatomy showing the major muscle (supra and inferspinatus muscles). Image credit: source. When siding and investigating a piece of suspected scapula bone, it should be noted that it is mostly a thin bone, and unlike the pelvis, there is no spongy bone sandwiched between the cortices. The following is taken from (yes that’s right!) White & Folkens 2005, page 202, with some modification. The glenoid cavity is teardrop-shaped, with the blunt end inferior. An isolated acromion is concave on its inferior surface. The clavicular facet is anteriormedially relative to the tip. For an isolated coracoid element the smooth surface is inferior whilst the rough superior. The anterior body is longer and thee hollow on the inferior surface faces the glenoid area. The spine thins medially whilst it thickens towards the acromion. The inferior border has a tubercle that points inferiorly, as seen in the above diagram. On the posterior body there are several transverse muscle attachment sites. 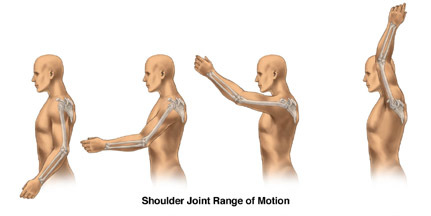 These are usually quite prominent, and are key indicators in helping to visualise the orientation of the scapula. Lateral view of the rotation of the shoulder joint. Image credit: Wikipedia. Anterior view of the rotation of the shoulder joint. Image credit: Wikipedia. There is a perception, garnered from the earlier descriptions of the Arctic aboriginal groups, that the native Eskimo groups were passive, of ‘quiet repose and lived in a state of non-violence’ (Larsen 1997: 131). New bioarchaeological investigations are helping to provide data that is slowly leading to a revision in the review of those perceptions. A Saunaktuk site, dated to the late 14th Century AD, located east of the Mackenzie Delta in the Canadian Northwest Territories has provided compelling evidence of violent confrontation between native groups (Larsen 1997). As Larsen (1997: 132) discusses the skeletal remains of 35 Inuit Eskimo Villages represented at the site, it becomes clear that there is evidence for violent death and body treatment, which is indicated by extensive perimortem skeletal modifications. A large percentage of the whole group are adolescents (68.6%), whilst all of individuals represented had not been purposefully buried. It is suggested that the group represents a targeted selection whilst other adults where away from the site (Melbye & Fairgrieve 1994). 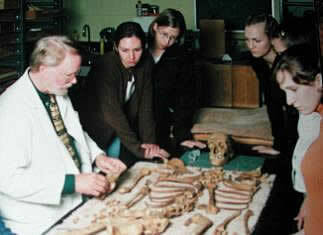 Studying the bones in anatomical position. Image credit: Google. On the skeletons themselves, hundreds of knife cuts were evidenced. These ranged from around the articular joints and neck vertebrae, which is indicative of decapitation and dismemberment (Larsen 1997). As well as this there are numerous cuts on the facial bones on many of the victims, with cuts also present on the clavicles and scapulae as well (Melbye & Fairgrieve 1994). Many of these cuts reflect an overall pattern associated with dismemberment, removal of muscle and other soft tissues as well as intentional mutilation. There is the distinct possibility of cannibalism having been carried out at this site. In particular, unique to this Saunaktuk skeletal series, is the ‘presence of gauges at the ends of long bones’ (Larsen 1997: 132). The modifications of the gauges on the adult distal femora are consistent with oral tradition describing a type of torture where the victims knees were pierced and the individual dragged around the village by a cord passed through these perforations’ (Larsen 1997: 132). We have to understand that there is a vast rich historical record that does help to provide a context for this group to group violence as recognised by the skeletal and oral records. Violent interactions at this locality occurred between the groups, and intergroup violence has been recorded by many explorers for the Hudson Bay Company in the 18th century (Melbye & Fairgrieve 1994). Other pre-contact sites such as Kodiak Island in Alaska, alongside the sites of Uyak Bay, Crag Point & Koniag Island there is also evidence of culturally modified human bone. However, we must remember the context in which these actions had taken place. There are a small selection of the overall number of ore-contact Arctic sites in this area. Please refer back to previous posts by my guest blogger Kate Brown on the pre conditions and difficulties of diagnosing cannibalism. 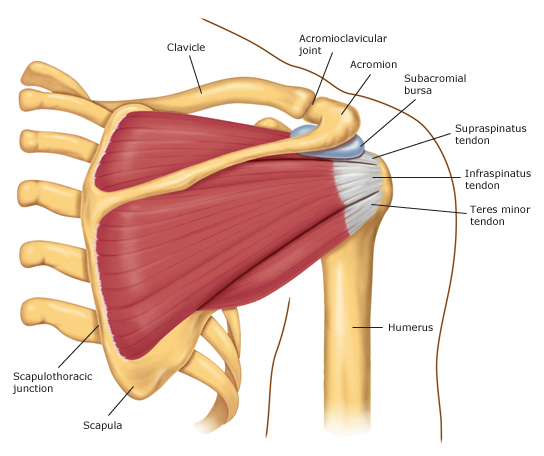 For detailed information on the muscles surrounding the shoulder joint, the 1st and 2nd part of this blog post has in depth knowledge on the muscle and bone elements and attachment sites. A short article dealing on breaking the clavicle and Lance Armstrong’s cycling accident. A fine post by Afarensis on the Homo Floresiensis & humeral torsion. Marsland, D. & Kapoor, S. 2008. Rheumatology and Orthopaedics. London: Mosby Elsevier. Melbye, J. & S. I. 1994. ‘A Massacre And Possible Cannibalism In The Canadian Arctic: New Evidence From The Saunatuk Site (NgTn-1)’. Arctic Anthropology. Vol 31. No 2. PP 57-77. Wisconsin: University of Wisconsin.